Well, I have taken a little bit of time from starting my new business (more on that later) to catch up on some anime, as well as start a new series. I just finished watching the last episode of Girls Bravo Season 1 and would recommend it to someone that’s looking for a very light, anime. It’s not heavy on the fanservice, but definitely has elements in there. 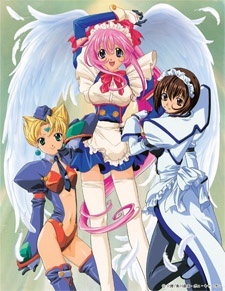 I started to watch Steel Angel Kurumi after seeing a video of someone dressed as Saki from Steel Angel. If they are willing to dress with mask and all to make a video, Steel Angel must be at least decent. Steel Angel reminds me a little bit of MahoroMatic. In MahoroMatic, Suguru is a boy that has lost his parents and lives alone. Suguru lives in a time where a secret agency known as Vesper fights alien invasions. There ultimate secret weapon is a cute android named Mahoro. She has served Vesper proudly, but they decide to give her free time before her battery runs out. She chooses to become a maid for Suguru, and develops a crush on him. Here’s an opening and summary of Steel Angel Kurumi, and that same video of Saki. Enjoy.